L.A. Youth writers recommend the books Naomi and Ely’s No Kiss List and Fallen. L.A. Youth writers recommend CDs by The Black Eyed Peas, Florence + The Machine and Maroon 5. Victor, 17, was hoping for more action in this romantic update of the classic fairytale. Essay contest: What brightens your day? Essay contest winners wrote about their daughter, their brother’s notebook and the little things you miss when in jail. These are letters we received about stories that appeared in the November – December 2010 issue of L.A. Youth. Red Riding Hood is a re-imagining of the classic fairytale, this time with a werewolf instead of a wolf, and a love triangle. The romance makes it perfect for those who like love stories, but I was disappointed because I thought it would have been scarier. The movie is set in a village that has been terrorized by a werewolf for years. Until now, the werewolf has killed only the animals the town offered him, but now it’s killing people. The story revolves around Valerie (Amanda Seyfried) who is in love with Peter (Shiloh Fernandez) who is a woodcutter. But her parents have arranged for her to marry a blacksmith, Henry (Max Irons). When Valerie’s older sister is killed by the werewolf, a priest comes to town to help the villagers hunt down the killer. He tells them that anyone could be the wolf, because the werewolf takes a human form by day. Then the people of the village start to suspect each other. In one scene, Valerie has a vision and sees everyone in town, thinking anyone might be the werewolf. Her vision haunts her. I thought this was well done because I started suspecting everyone too. 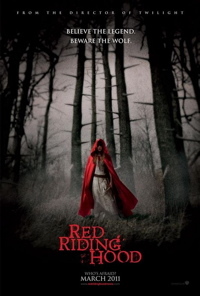 I think that the movie did a good job adapting the story of Little Red Riding Hood from a children’s tale to something darker. It started slow, but after the first 20 minutes, when the werewolf attacks the village, I got into the story. The villagers thought they killed the werewolf, but they didn’t know that they had just killed a regular wolf. Then the werewolf attacks them while they’re celebrating. He was jumping on roofs and villagers were flying. The scene is fast and action-filled. There are only three action scenes and I wish there would have been more. Some things were predictable, like whom Valerie ends up with. And there isn’t a big twist at the end. I really wanted the moment when the werewolf’s identity is revealed to be dramatic, but before I knew it the movie was over. Sometimes I got the feeling I was watching Twilight because, like Twilight, there were aerial shots of a forest and the voice of a girl talking about her life. But I wasn’t surprised because Catherine Hardwicke, who directed this movie, was the director of the first movie from the Twilight Saga. I didn’t like Twilight. But if you like teenage love, mystical creature dramas then you’ll probably like this movie. Otherwise go see something else.